Poinsettias are a holiday favorite to give and receive. That is until the leaves turn yellow and start falling to the floor. Follow these few tips to keep your poinsettia looking its best. Protect your plant whenever it travels outdoors. Then remove the protective sleeve as soon as possible. The upward bent leaves release ethylene that decreases the longevity of the colorful display. Pinch off the yellow knobby growths in the center of the colorful leaves known as bracts. This helps extends the colorful display. Pick the right location. Place your plant in a cool bright spot out of cold and hot drafts. Water thoroughly whenever the top inch of soil begins to dry. Then pour off any excess water that collects in the foil wrap, basket or saucer. Overwatering and leaving plants sit in excess water is probably the most common cause of failing plants. 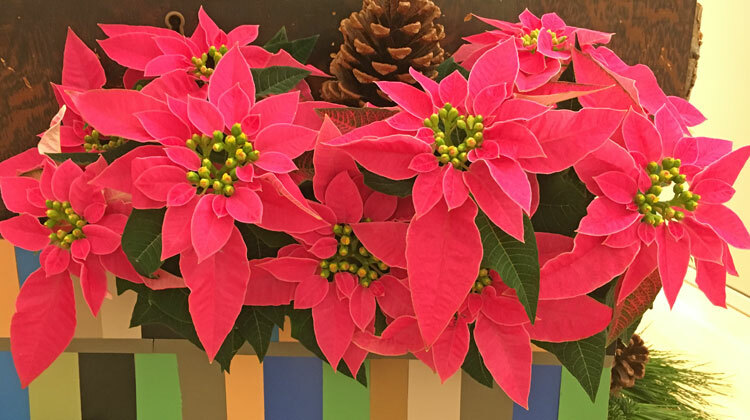 A bit more information: Hot pink is one of the newer color choices in poinsettias. The compact Princettia will hold on to its colorful bracts for months. Luv U Hot Pink has deeper pink bracts with white edges.